Will Sim2's latest projector improve on its legacy? Building on the strengths of its predecessor, the HT300E, Sim2's HT305E has a new lamp, better optics and improved electronics. The design is based on the latest high contrast DarkChip3 DLP optical chip. With Sim2's Alpha Path light engine, it is good for a claimed 3200:1 to 3500:1 contrast ratio and a resolving power which means the projector is HD Ready. The HT305E will work at the lowest of the main HD standards, namely 720p, that is pictures with 720 vertical and 1280 horizontal lines of data. But 1080i/p, the senior HD standards, will be displayed at reduced resolution using the SIM2's internal scaler. So far so good, but what kind of experience does the HT305 deliver? Earlier Sim2 projectors often had rather noisy cooling systems, but this one is a lot less rowdy, thankfully. 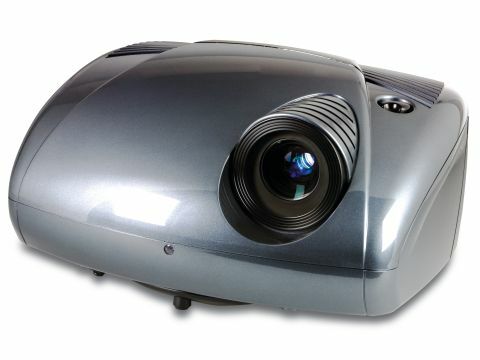 The projector's optical system is so designed that the HT305E is best used behind the viewing plane in most rooms, which usually has the welcome secondary effect of reducing still further the annoying sound of cooling fan noise. Ergonomic issues include a well designed menu system, with video test screens which help when aligning the projector to the screen, and adjusting colour. Another benefit, and this doesn't correspond to any specific claim from Sim2, is that the HT305E appears to pump out less heat than most, which may be a factor in the relatively quiet cooling system too. Finally, Sim2 bows to no one in the physical presentation of its projectors. The HT3005E could have stepped off a shelf of a museum of modern industrial design. It looks much like previous Sim2 models, but there was no compelling reason to change. But what we're most interested in here is the projector's onscreen performance: we're happy to report that it's certainly strong. There is more than adequate visual punch in any reasonably well darkened environment if projecting pictures up to 3m wide. From the box, colour reproduction is vivid and uniform, but not as neutral as some competitors. The picture is warm, too warm in fact, and it is hard to avoid the conclusion that there is an excess of orange in the pictures, and areas that should be completely black (a hard job for any projector, even DLPs) look a little milkier than expected. But these things can be adjusted through the menu. Our tip would be to leave it a week for the projector to settle down before making long term adjustments. Processing and scaling of moving images is good, but not the best around. HD video can betray too much 'staircasing' of diagonals and other unwanted artefacts, but picture quality using straight DVD material (480/576p) is particularly sharp and clear, at times almost emulating the benefits of HD from standard video sources.